NEW YORK (CNNMoney.com) -- As Toyota's mass recall threatens the leading automaker's reputation, several rivals are rolling out incentives to reel in Toyota customers looking to get rid of their cars. General Motors is offering incentives of $1,000 and low financing rates specifically for Toyota customers worried about their recalled vehicles. "We decided to make this offer after receiving many e-mails and calls from our dealers, who have been approached by Toyota customers asking for help," GM said in a statement. The offers will run through the end of February. Starting Wednesday, GM started offering $1,000 rebates or up to $1,000 to help pay off current leases on Toyota products. The automaker is also offering 0% financing on most models for Toyota customers. The offers apply to 2009 and 2010 model year cars. Hyundai said it is offering a $1,000 rebate for anyone who trades in a Toyota from Thursday to February 1. Customers who trade in their Toyotas with the trade incentive can purchase one of three models only: a Hyundai Sonata, Elantra or Elantra Touring. Ford is offering $1,000 to customers trading in Toyota Motor Co. products. The offer began Wednesday but a Ford spokeswoman said the offers are not targeted at Toyota's recall problems. Customers are also being offered the same $1,000 on Honda products. Chrysler is offering an additional $1,000 to customers who trade in their Toyota Tundra, Tacoma or Sienna and purchase or lease a new Chrysler, Jeep, Dodge car or Ram truck. It is also offering $1,000 in bonus cash to drivers who want to turn in a leased Toyota to buy or lease a Chrysler product. Such "conquest incentives" -- incentives targeted at owners of other manufacturers' vehicles -- are common in the industry, GM spokesman Tom Henderson said. However, some of the incentives are designed to take advantage of Toyota owners' worries at a time when they're concerned about the safety and quality of their cars. Toyota announced last week that it was recalling 2.3 million cars, SUVs and trucks for a problem with a potentially sticky gas pedal. This was after the company recalled 4.2 million vehicles -- many of them the same as last week's recall -- for a problem in which the gas pedal could become stuck on the floormat. Toyota recently announced that will temporarily stop selling models affected by the most recent recall, including some of their most popular products like the Camry sedan and the Rav4 small SUV. For its part, Honda said the recall "has no impact whatsoever on Honda or Acura customers" and that it "will not undertake any sales activities that expressly target Toyota customers." 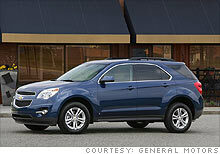 The problem plays to GM's current strengths, said James Bell, an analyst with Kelley Blue Book's KBB.com. Some of GM's strongest products, like the Chevrolet Malibu sedan and Chevrolet Equinox SUV, are strong competitors to products Toyota is now not selling. "The Equinox is the obvious buy over a Rav4," he said. If the Chevrolet dealers were still selling last year's Equinox, before the new, completely redesigned model was introduced, GM's position wouldn't have been as strong, he said.